The month of May proved to be an eventful month for the leading gold and silver stocks with lots of wide swinging movement, mostly to the downside. This volatility didn’t go unnoticed by Wall Street either, with several articles appearing in the leading financial publications drawing investors’ attention to the "attractive" volatility currently underway in the metals arena. The question weighing on the minds of most gold and silver stock traders is whether the sector has bottomed and if not, how much longer until it does? On an immediate-term basis the gold/silver stock sector is "oversold" based on several internal indications and could get a mild relief rally in the coming days. For example, among 50 actively traded and representative gold shares that I look at each day, most of them are currently below their 15-day moving averages. For the last few days there have been at least 40 of these 50 stocks closing each day below their respective 15-day MAs, which indicates at the very least that the sector should get at least a baby bounce to correct this internal imbalance in the immediate-term. Also worth mentioning is that the 5-day, 10-day and 20-day price oscillators for the XAU gold/silver index are coming off an oversold reading similar to the one following the earlier March bottom. You may recall at that time the XAU had peaked around 155 in early February and then began a 6-week correction that took the XAU below its 90-day moving average and down to the 120 area before bottoming and reversing the decline in early March. As you can see in the above daily chart of the XAU there is a similarity between the correction bottom of the February-March decline and the one just experienced in May. In both corrections you can see the XAU slightly penetrating below its 90-day moving average (red line) before finding support and reversing back above it. Even the MACD indicator shown in the above chart is at a similar "oversold" reading compared to the correction low of earlier March. The similarities end there, however. The February-March correction in the gold/silver stock sector was different from the correction currently underway in that while the XAU fell temporarily below the 90-day MA at the early March low, the Amex Gold Bugs (HUI) index and CBOE Gold Index (GOX) did not but instead managed to stay above the 90-day MA in reflection of the relative strength among certain mining shares at that time. Another difference between the early March low and the current one is that the leading silver mining shares were able to maintain their advances by staying above the 30/60/90-day moving averages and even made higher highs and higher lows at the time when many actively traded gold shares were making lower highs and lower lows. As discussed in my previous article entitled "Leading indicators for the gold/silver stock sector," the silver shares are sensitive and often act as leading indicators for the gold stocks. At the most recent peak in earlier May the leading silver stocks had already topped and were in decline and many still haven’t confirmed a bottom yet. A relief rally coming off an oversold extreme is not the same as the start of a new bull market leg. For that to happen the sector will require some more time to repair the internal damage inflicted following the previous rally peak in earlier May. One of the main confirmations of a gold stock bottom will be in the internal momentum readings of the short-term momentum indicators for the sector. Previous gold stock corrections ended when the internal momentum among the 50 actively traded gold shares reversed from a lower reading to a higher reading. At market tops, momentum tends to precede a decline in the XAU while at bottoms a reversal in momentum from down to up happens concurrently with price reversals. One of the main indications of a reversal in short-term momentum is reflected in the chart showing the rate of change (momentum) of the new highs and new lows among the 50 actively traded gold shares. 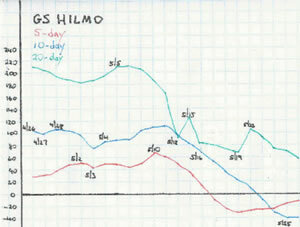 Known as GS HILMO (Gold Stock Hi-Lo Momentum), it shows the reversals in internal momentum on a 5-day, 10-day and 20-day basis and the interactions between them. At the last correction low back in March, GS HILMO reversed higher after falling below the "zero" line in February to confirm the bottom. As you can see in the most recent GS HILMO reading, this hasn’t occurred yet. Therefore the gold stock correction is presumed to still be underway, and notwithstanding the possibility of an oversold rally, there could still be a lower low among the actively traded gold and silver shares before the next bottom is confirmed. Clif Droke is the editor of the daily Durban Deep/XAU Report, a technical forecast and overview of several leading gold stocks, including DRDGold and the QQQ available at www.clifdroke.com. He is also the author of numerous financial books, including "Gold Stock Almanac 2006".